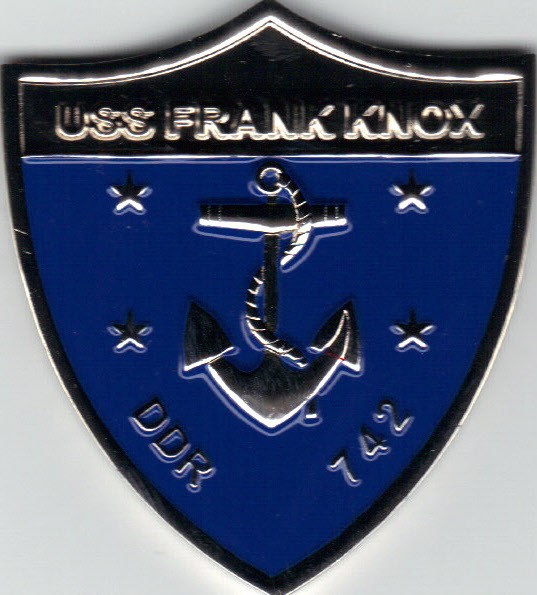 The USS Frank Knox (DD-DDR-742) was a 2200 ton, long hull, FRAM II, Radar Picket Destroyer. Her primary mission was to provide fast carrier attack groups with an effective early warning capability. She was secondarily concerned with anti-submarine warfare and employment as a surface action or naval gunfire support unit. She was a Gearing-Class destroyer with a standard displacement of 2425 tons; full load displacement was 3520 tons. Regular overhaul periods changed the ship's characteristics during her 26 years of active service. In 1967 her armament included a main battery of three twin 5"/38 gun mounts., two 7.2" anti-submarine rocket launchers forward and two triple-tube torpedo mounts amidships. In addition, she was equipped with a large number of sophisticated radar detection, sonar, communication and fire control equipment. The Frank Knox was built in Boston Naval Shipyard, Boston Massachusetts in 1944 and received the name of the World War II Secretary of the US Navy and well known publisher William Franklin Knox. She is 390 feet long, 41 feet wide and carries a crew of 16 officers and 260 enlisted men. During World War II Frank Knox participated in Admiral Halsey's Third Fleet Operations against Japanese home islands and was present in Tokyo Bay when the Japanese Surrender document was signed on September 2, 1945. She was stationed in Tsingtao, China from 1948 until shortly before the communist revolution in that country on October 1, 1949. On March 18, 1949 she was redesignated as DDR-742. The ship returned to the Western Pacific waters during the Korean Conflict (1950-1953) to serve as an original unit of "Task Force 77" in actions at Inchon, Hung Nam and Wonsan Harbor. In February 1955 Frank Knox took part in the Nationalist Chinese evacuation of the Tachen Islands. 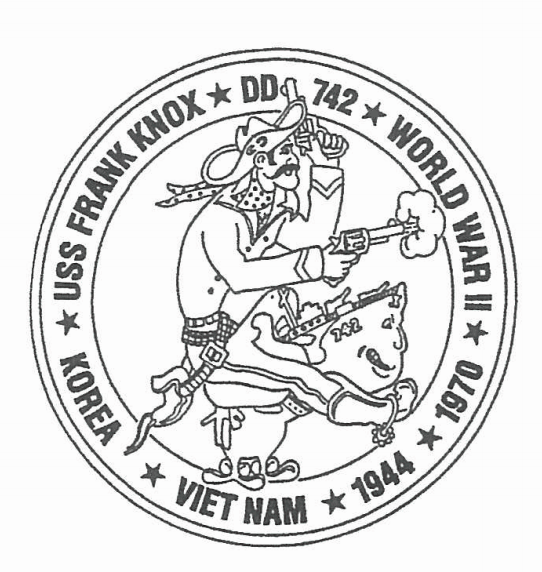 From late 1961 until September 1964 Frank Knox was homeported in Yokosuka, Japan along with USS Midway, CV-41 as part of the US Seventh Fleet. During this period, she served in a variety of supporting roles throughout the Western Pacific, from the Phillippine Sea to the Gulf of Tonkin. 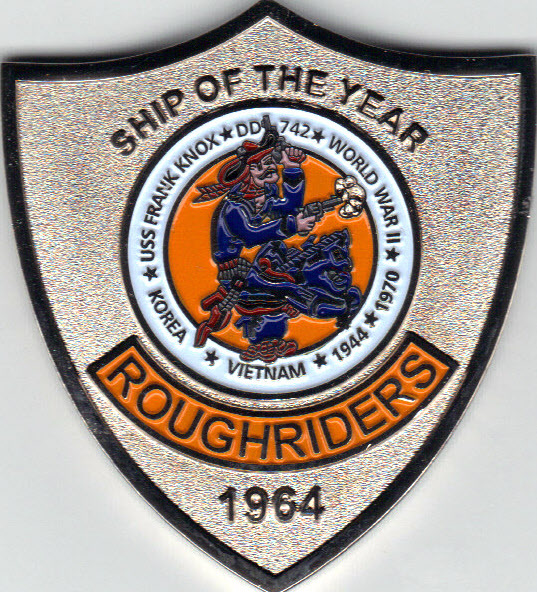 Late in 1963 Frank Knox was named "Ship of the Year" and awarded the Marjorie Sterrett Battleship Fund Award. In early Spring 1964 she participated in the First Concord Squadron Indian Ocean cruise to Madagascar, Kenya and Aden. Later in 1964 she visited Eastern Australia prior to proceeding to her new homeport San Diego, California. 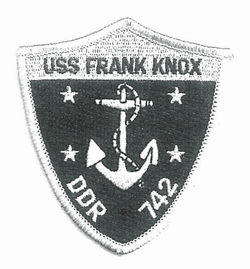 Frank Knox deployed from her new homeport on June 4, 1965. While in transit from South China Sea to Taiwan she grounded on Pratas Reef on July 4, 1965. Extensive salvage operations pulled the ship clear of the reef and on August 24, 1965 the ship was towed to Kaohsiung, Taiwan. She later was transferred to US Naval Ship Repair Facility Yokosuka, Japan for extensive repair and upgrading. Frank Knox was refloated on August 22, 1966. She put to sea October 18, 1966 and after sea trials returned to her home port San Diego, California in late 1966 and took her place in Destroyer Division 172 resuming her duties as an operational unit of the Pacific Fleet. Frank Knox deployed July 1967 to the waters of Southeast Asia and began a climb tha brought her to the level she previously held as one of the most distinguished ships in the Pacific Fleet. During the competitive year 1968 she walked off with the Battle Efficiency "E" for Destroyer Squadron 17 plus individual awards in Gunnery, Engineering and Anti-Submarine Warfare. 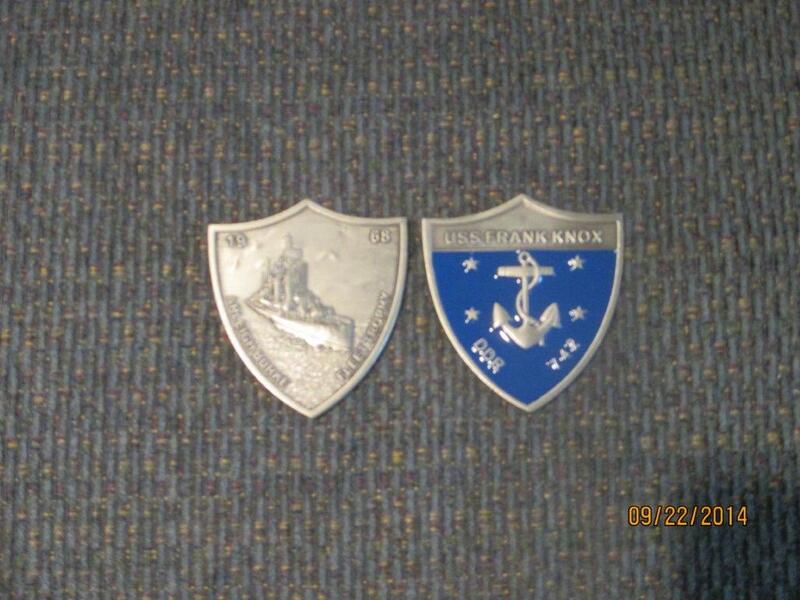 On November 20, 1968 Frank Knox was formally awarded the Arleigh Burke Fleet Trophy. January 1, 1969 she was re-designated DD-742, her original designation. 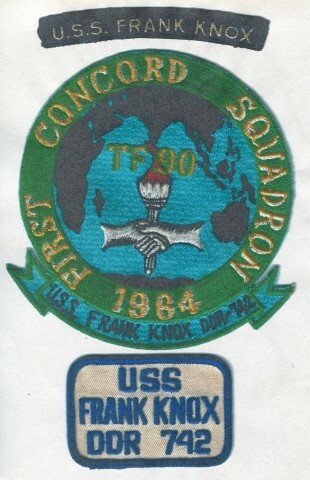 On January 4, 1969 Frank Knox again deployed to the Western Pacific. Following a highly successful second deployment she returned to San Diego California. She was decommissioned as an active unit in January 1971 and struck from the records on February 3, 1971. She was transferred to the Greek Navy on February 3, 1971and renamed Themistocles D-210 and served until decommissioned by the Greeks on August 31, 1992.